An overnight cold front is expected to drop low temperatures into the 40s on Tuesday and the 30s on Wednesday, according to the National Weather Service in Brownsville. 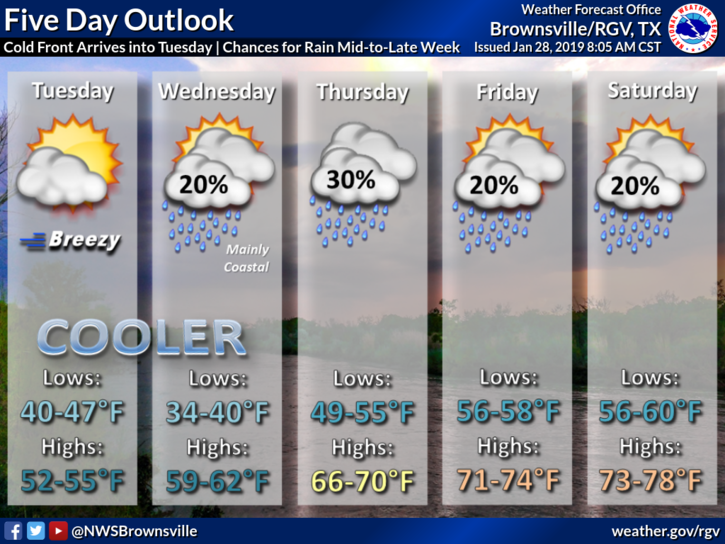 High temperatures should reach the 50s on Tuesday and 60s on Wednesday with a 20 percent chance of rain primarily on the coast. Cooler temperatures will last through the week with lows reaching the 50s and 60s through the weekend. The NWS forecasters also expect increased wind on Tuesday.